Click on any of the thumbnails below to see a larger version of the picture and use the Back button of your browser to return to this page. Please be aware that, depending on the speed of the connection used, some images may be slow to open or download. January 19, 2003: Forest fires rage around Canberra. December 3, 2002: Unusually symmetric contrail. Mike Jupp alerted me to this celestial racetrack at the Norwegian coast, west of Trondheim. 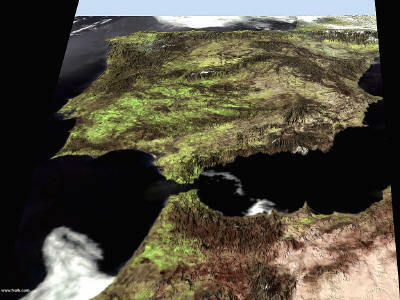 Iberian peninsula in 3D. 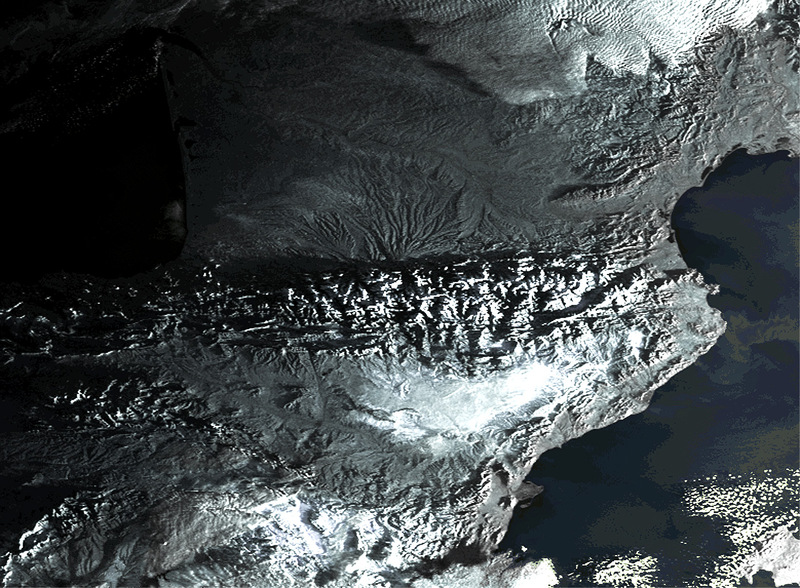 Real image handled with GTOPO30 data in 3DEM. 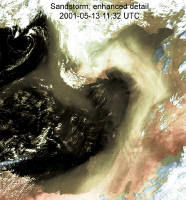 October 11, 2002: Very persistent contrails in St Petersburg area. An unusually stable weather system East of St Petersburg caused contrails of aircraft to remain largely unchanged over an extended period of time. 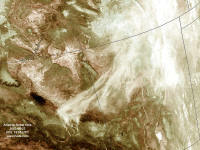 The 3 images were processed as channel 4-5 for higher visibility. 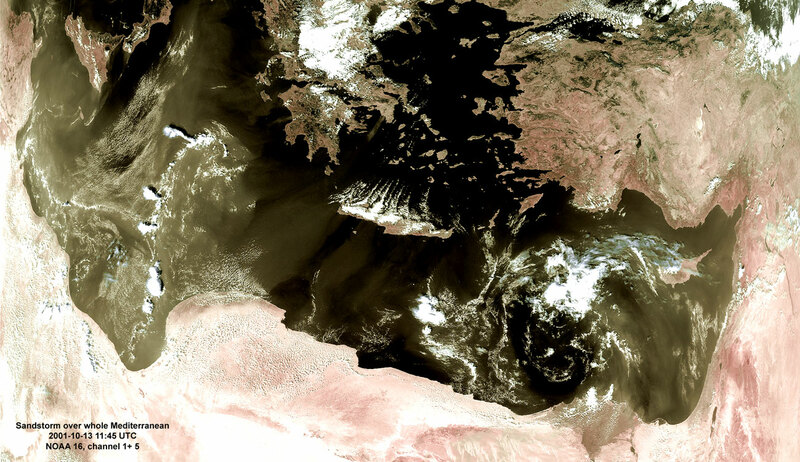 September 15: Huge masses of sand exit from Northern Africa to the Mediterranean. 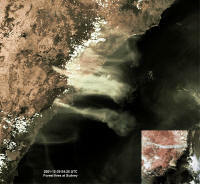 September 08, 2002: Fires have been raging east of Moscow for a prolonged period. This image from September 8 provides an impressive view of the distribution of the smoke. 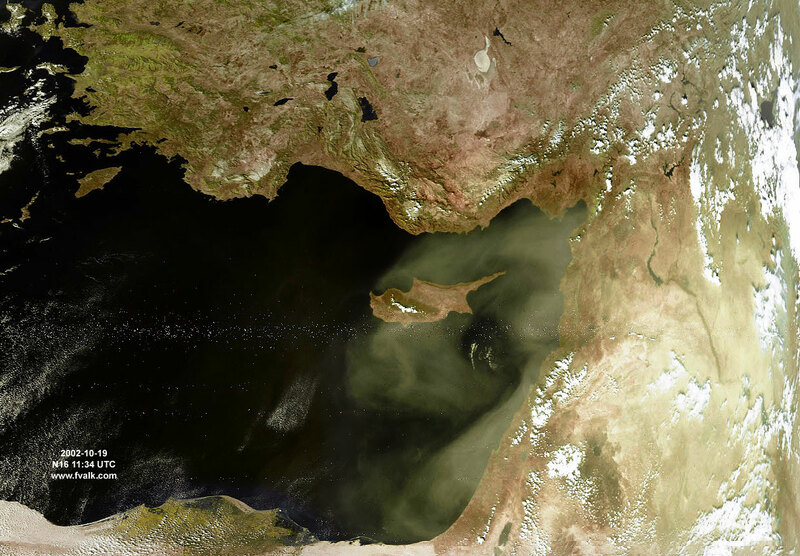 The coverage extends all the way from the Baltic and the Black Sea to the Caspian Sea and towards the Ural. 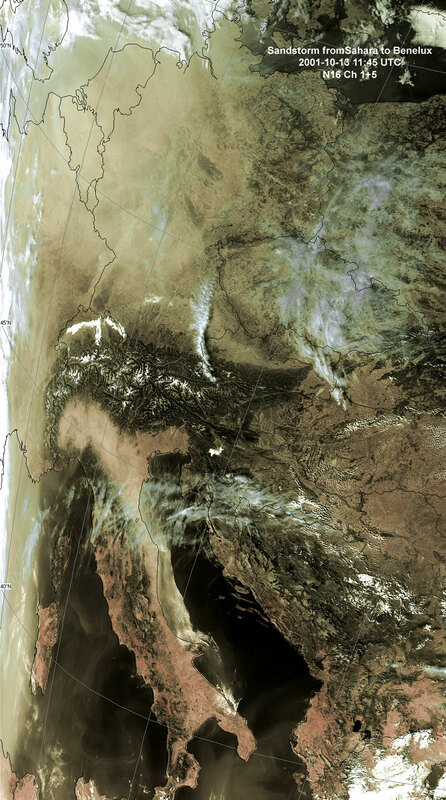 Composite Image enhanced with channel 1 as prime. 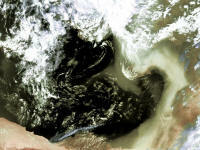 August 11, 2002: Fire in the Libyan oil fields. July 15, 2002: Details of Oil Fields in Lybia. 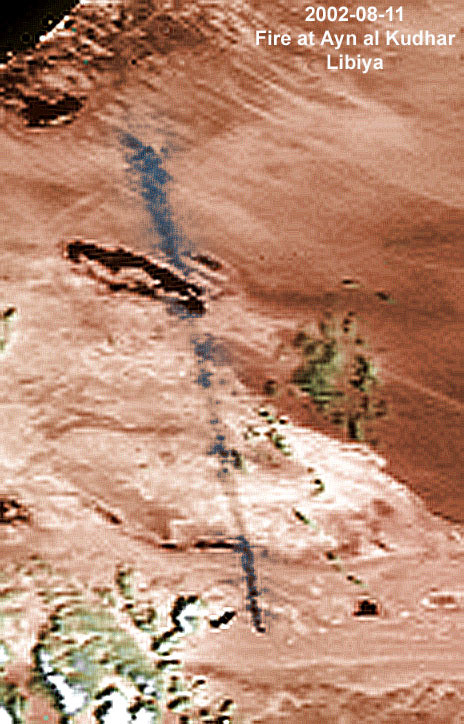 A question was raised by Mark Brodin on unexpected long, straight lines, seen in the Lybian desert well South of Benghazi. Some processing of archived imagery resulted in the image below. What is seen in the bottom half of the image is the infrastructure (roads plus pipelines) to the various drilling locations. When inspecting the horizontal bars more accurately one can see the individual pumping stations nicely sitting next to each other in "drilling streets" over the oil-field. Oil is transported Northward through the massive tubing system that is clearly visible. 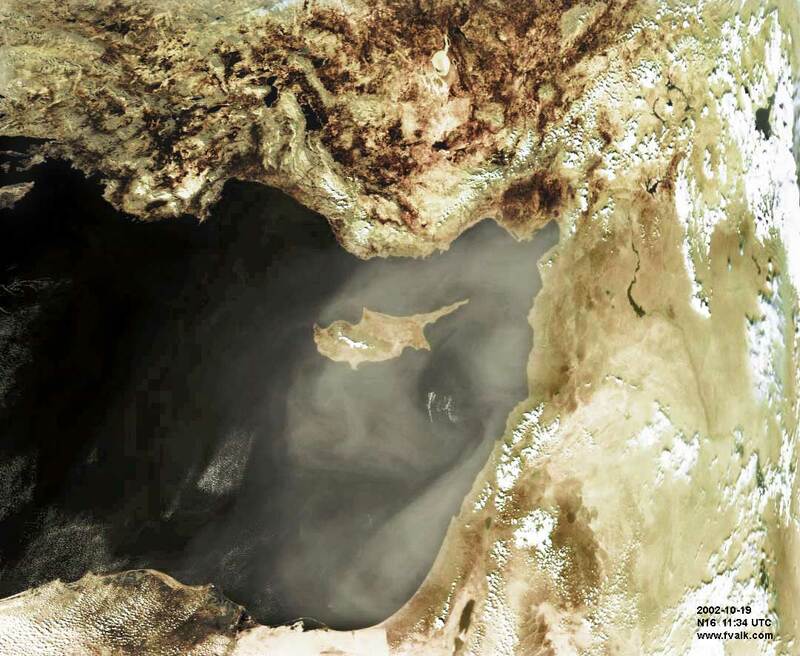 Just above the center of the image the refinery complex can be identified where on many locations the toxic gases are burnt. The smoke plumes and their corresponding shadows appear like superimposed dots throughout that area. The distribution network (to and fro) radiates out from the main installation and the spikes towards the north lead to the harbors of Benghazi and Suluq. 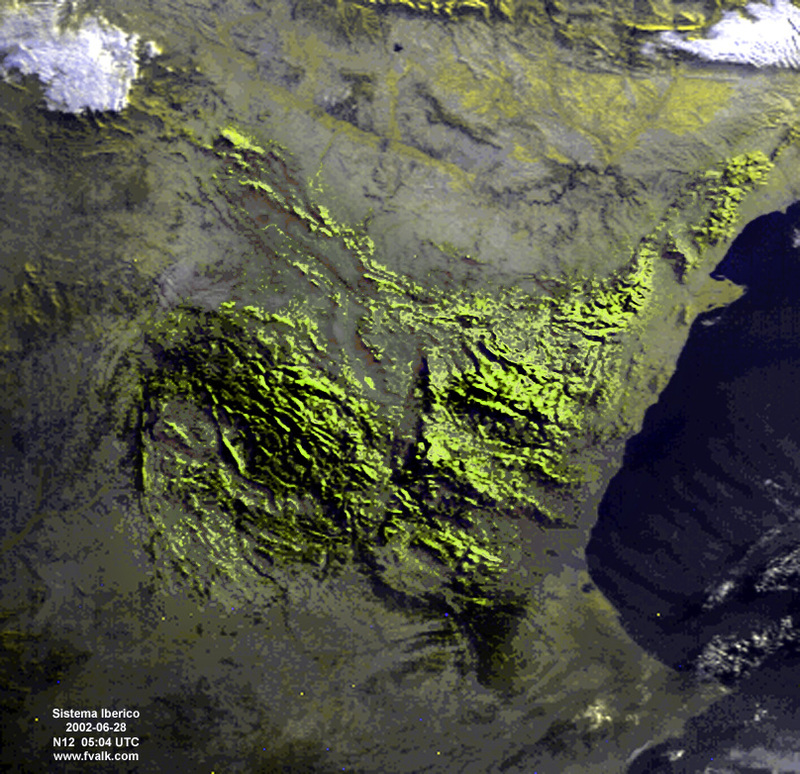 The image below was obtained at dawn, with the sunlight just skimming the North East of the Iberian Peninsula. An extra ordinary image of the mid February cyclone Guillaume, made by the Terra Earth Observation satellite (credit NASA), reminded me of a strikingly similar image of spiral Galaxy M51 (credit NOAO/AURA/NSF). This is a prime example of fractals brought to life from cosmic scale to down to earth proportion. Next time watch closely at the vortex in the kitchen's sink.. The M51 image has been flipped in order for the direction of rotation to coincide with Guillaume. 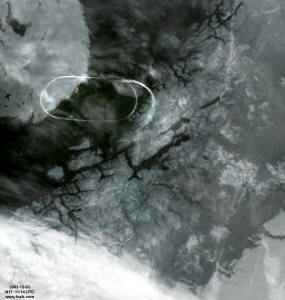 On January 19, 2002, the Nyiracongo, a volcano situated at the border between Congo and Burundi, erupted, sending down a deadly flow of molten lava towards the city of Goma. 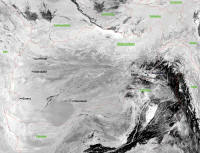 By the end of January the major activity had seized and the weather was fair enough for Landsat to take the image below. The volcano at the upper left in the image is the Nyamuragira, whereas the active Nyiracongo can be seen at the center. The fresh lava flow is visible in lighter yellow. The city of Goma, which was heavily hit by the lava flow, is situated at the lake where the lava stream ends. 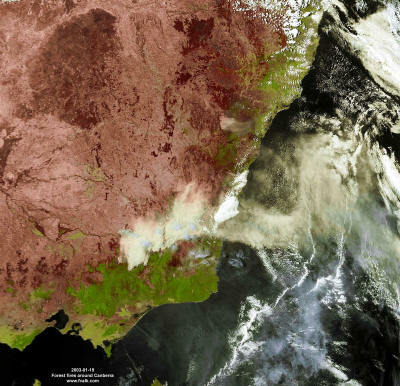 Below images show the forest fires raging around Sydney. 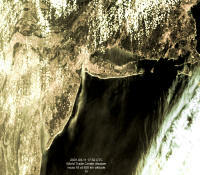 Images cover December 29 and 31 and January 5. 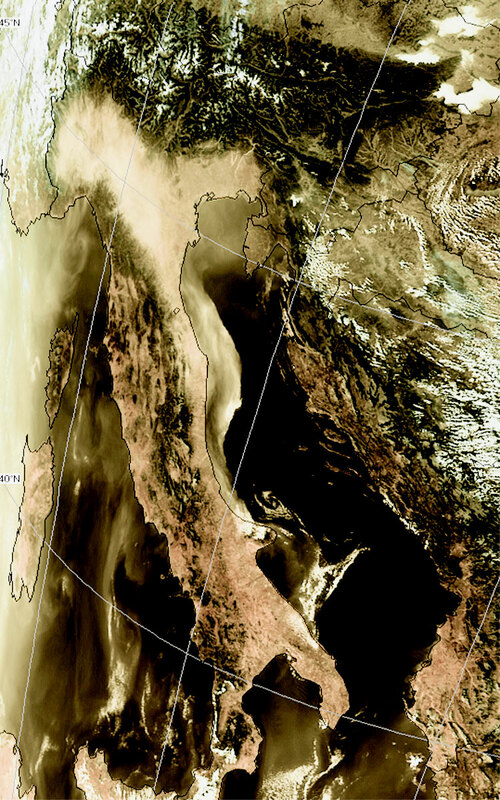 Raw data from SAA, processed with the HRPT Reader and enhanced with Photoshop 6. 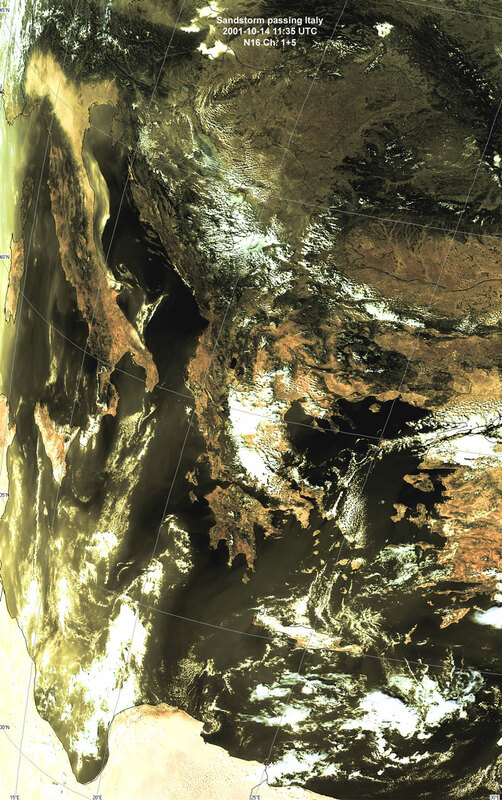 The image below was obtained from a NOAA15 pass at 07:47 UTC when the satellite passed right over the Pyrenees. The early morning sun casts long shadows towards the west and makes the otherwise difficult to see drainage system very clearly visible. 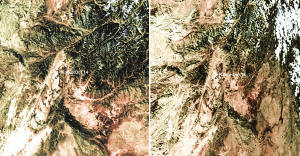 Snow shows up south-east of the Pyrenees and around the Sistema Iberico in the south. 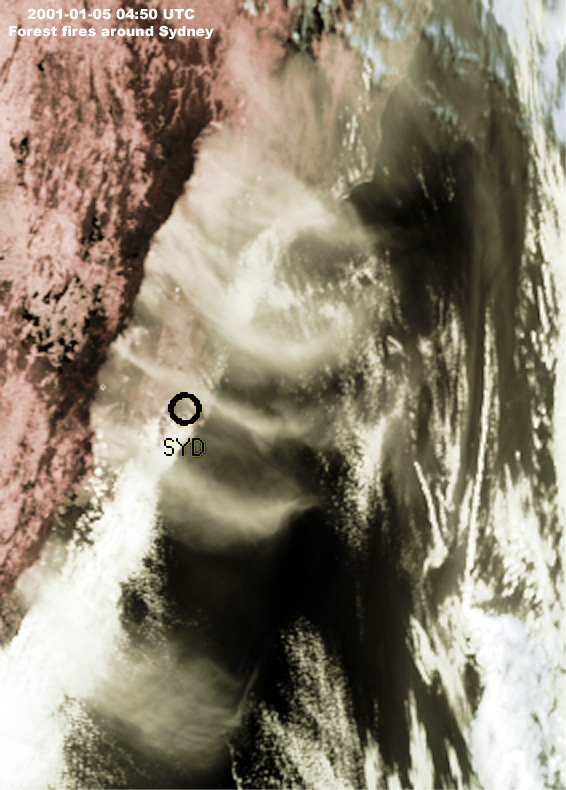 The image was produced using channel 2 and 5 in David Taylor's ReadHRPT program and later enhanced with Photoshop 6. 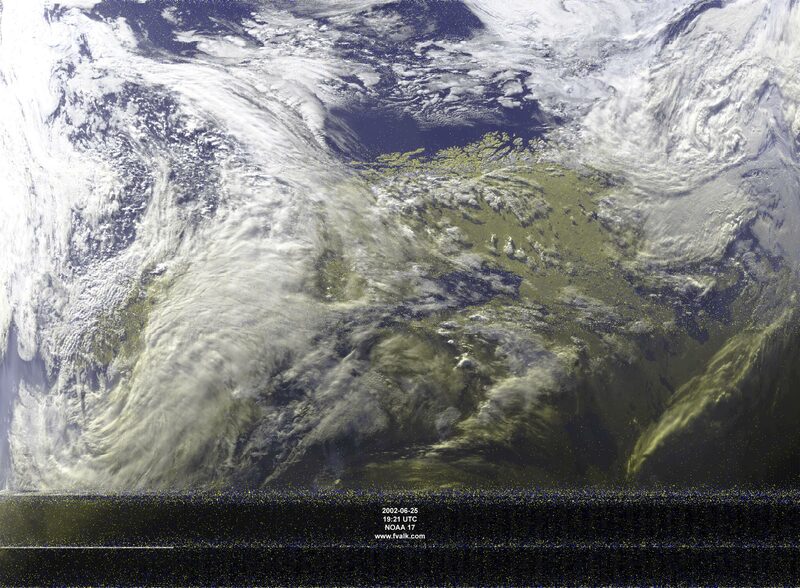 High resolution Image from a midnight pass of NOAA 16, processed using David Taylor's ReadHRPT program. 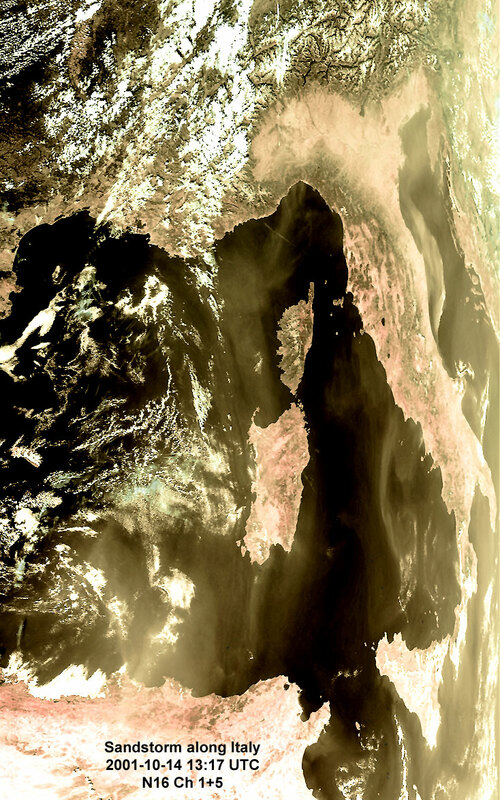 False colour composite of channel 3 and infrared channel 5. Bombing focus on Kabul. 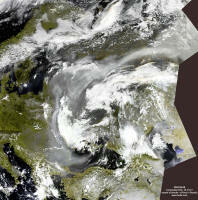 Images not corrected for different angle of observation. Enhanced in channel 2 and 4. 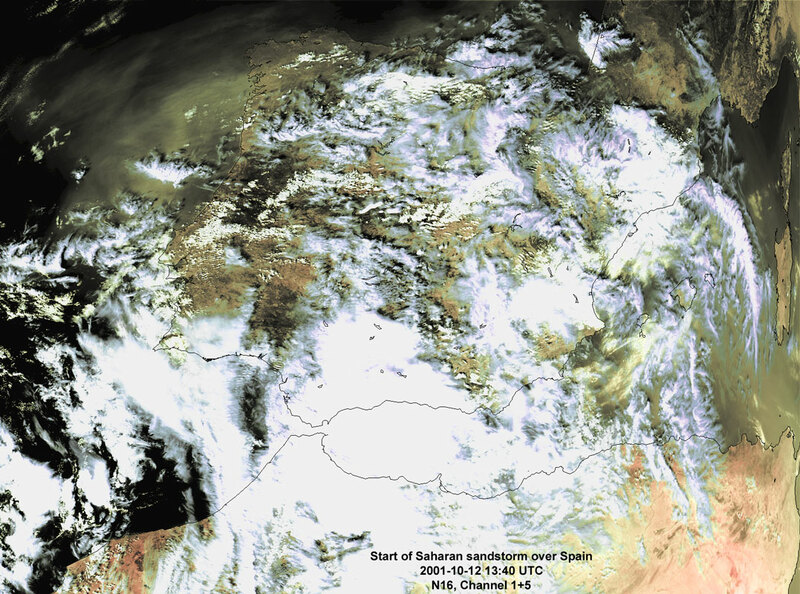 Sandstorms from the Sahara over the Mediterranean to Western Europe. October 12/13/14, 2001. On October 12, 2001, a strong wind started to blow north from the Sahara, carrying with it huge amounts of sand and dust. 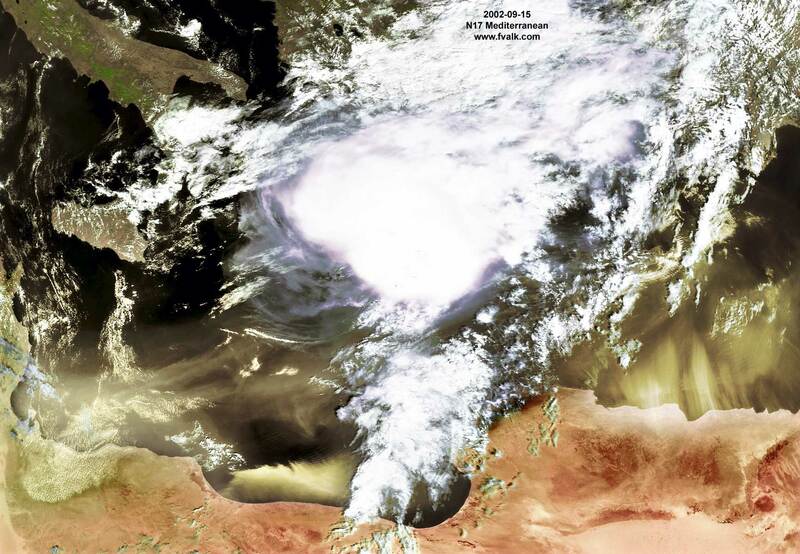 At first the effects were only noticeable over Spain, but in the days that followed, the whole Mediterranean was affected. 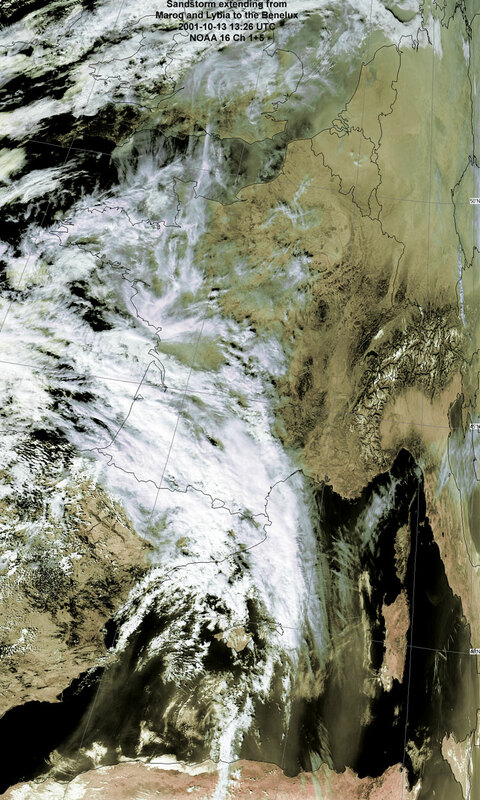 Two main streams extended northwards: one along Italy being captured before the Alps in the Po basin and a second one passing the Alps which was subsequently blocked from moving further North by an active weather system over the North Sea. View of Afghanistan, October 9, 2001. 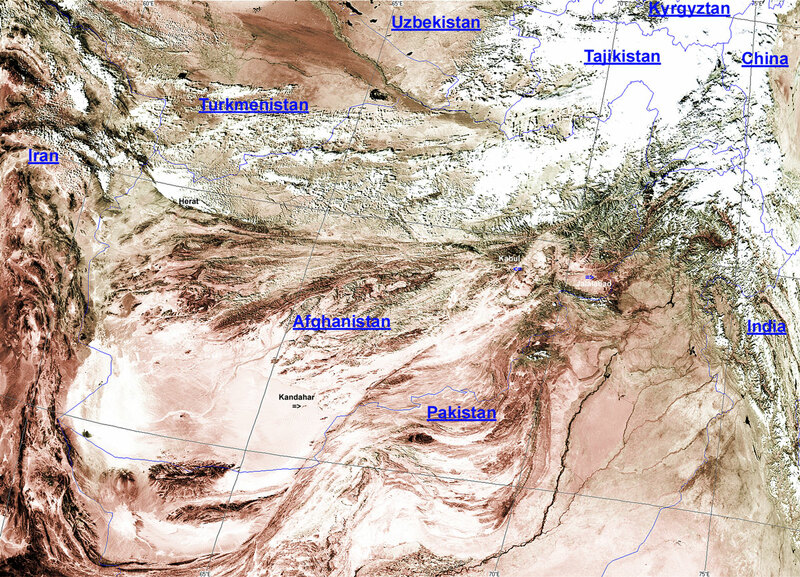 Images of landlocked Afghanistan with indication of bordering countries. The rugged mountainous terrain and adjacent desert are clearly noticeable. Views of the aftermath of the attack on the Twin Towers in New York, September 11, 2001. 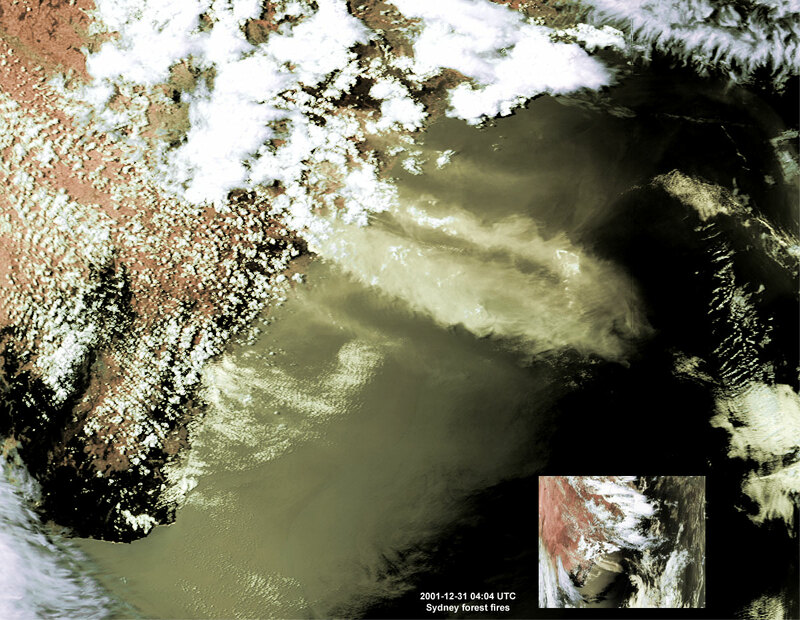 The images below show the huge smoke cloud that extends from Southern Manhattan for hundreds of kilometres southward along the East coast of the USA after the collapse of the Twin Towers. Although the Washington area with the attacked Pentagon building is within the periphery of this view, the consequential smoke cloud is not apparent.